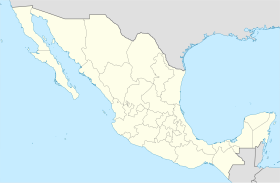 Los Algodones, Baja California, is a small Mexican town located on the extreme northeastern tip of the municipality of Mexicali, approximately 16 km (9.9 mi) west of Yuma, Arizona, USA. Its official name is Vicente Guerrero also called Molar City. It reported a population of 5,474 as of the 2010 Mexican census. It also serves as a borough seat of its surrounding area. Los Algodones is the northernmost town in Mexico, and at its northeastern tip is the northernmost point in Mexico, and in Latin America. Another interesting geographical distinction is that if someone were to travel in any of the four cardinal directions from anywhere in Algodones (due north, due east, due south, or due west), they would cross a U.S. border. From the U.S. side, Los Algodones is most easily reached via Interstate 8 and south a short distance (3.33 Km / 2.07 mi) along State Route 186/Andrade Road to the international border at Andrade, California. From Andrade, visitors can elect to park their vehicles for a small fee (overnight parking US$16) and walk across the border, or they can drive across. The popularity of both inexpensive prescriptions and medical care catering to Canadian and U.S. senior citizens has prompted a virtual explosion of pharmacies, opticians and dental offices since the 1980s. They have largely displaced many of the open-air shops and restaurants immediately across the border, and have effectively shifted the town's focus from tourism to medicine. Nevertheless, a number of shops and restaurants remain, and Los Algodones capitalizes on the tourist trade with frequent fiestas throughout the year, most notably around the Christmas season. The exact geographical location is 32°42′55″N 114°43′44″W﻿ / ﻿32.71528°N 114.72889°W﻿ / 32.71528; -114.72889 at an elevation of 110 feet/33.5 m above mean sea level. The Spanish-language name Los Algodones translates into English as "the cotton plants". The origin of the name is unknown. Transportes Miguel Siga, a private bus company, provides service between Mexicali and Los Algodones. Yuma County Area Transit provides service from Andrade to Yuma. Wikivoyage has a travel guide for Los Algodones. ^ Robbins, Ted. "A Reason To Smile: Mexican Town Is A Destination For Dental Tourism". NPR. National Public Radio. Retrieved 29 December 2015. ^ Judkins, Gabriel (June 2007). "Persistence of the U. S.--Mexico Border: Expansion of Medical-Tourism amid Trade Liberalization". Journal of Latin American Geography. 6 (2): 11–32. ISSN 1545-2476. ^ Gyek, Juana M. (2006-08-14). "Mystery surrounds origin of town's name". The Sun. ^ "Estado de Baja California-Estacion: Presa Morelos". Normales Climatologicas 1951–2010 (in Spanish). Servicio Meteorologico Nacional. Archived from the original on 18 May 2015. Retrieved 8 May 2015. ^ "Extreme Temperatures and Precipitation for Presa Morelos (SMN) 1961–2010" (in Spanish). Servicio Meteorológico Nacional. Archived from the original on 18 May 2015. Retrieved 8 May 2015.